Amazon has officially entered the beauty arena with the launch of its own skincare label. 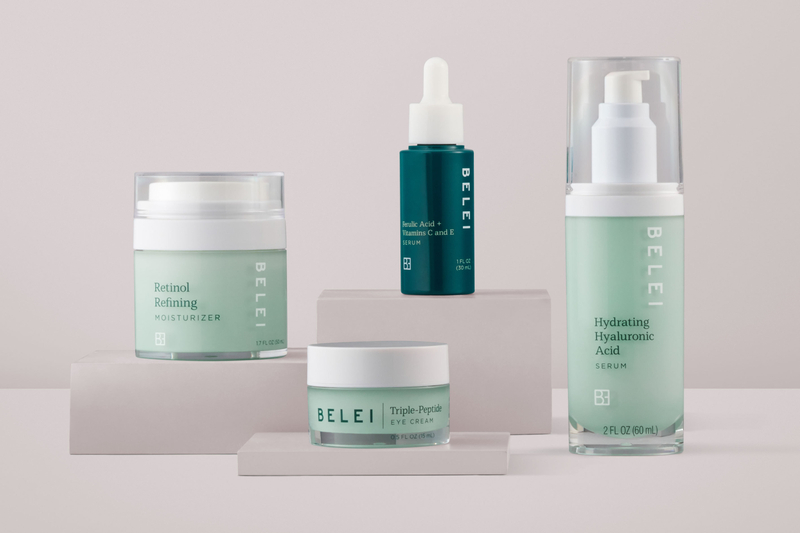 The online retail giant, which has been a major beauty shopping destination for some time, has unveiled the in-house brand ‘Belei’, a 12-piece line of skincare products that are free of parabens, phthalates, sulfates and fragrance and are not tested on animals. The line, which is now available on the Amazon website, has been designed to tackle a range of skin issues, such as acne, dullness and dehydration. From left to right: Belei Retinol Refining Moisturiser, Belei Triple-Peptide Eye Cream, Belei Ferulic Acid + Vitamins C and E Serum, Belei Hydrating Hyaluronic Acid. The collection spans everything from oil-free micellar wipes for easy makeup removal to a revitalising clay charcoal mask to clean the complexion. There is also a blemish control treatment, a tri-peptide blend eye cream and several moisturisers and serums, including a retinol moisturiser, a vitamin C moisturiser and a Hyaluronic Acid serum. Everything in the series comes presented in bottles made of post-consumer recycled resin and 100% recyclable carton packaging, and products are priced from US$9 to US$40. Amazon launches in-house beauty brand 0 out of 5 based on 0 ratings. 0 user reviews.